real hands on, I think we are doing just fine. of time and think that talking is worthless, so i won't hold you. and talking endless speculating is fruitless. I want to see your other stuff, so get back on it and blab later. Last edited by BroMikey; 03-11-2016 at 04:06 AM. to compare with one another, we are in conflict. but that is not helping us here, let's do it right. already patented. END OF STORY. as agreed on by MACK. END OF STORY. 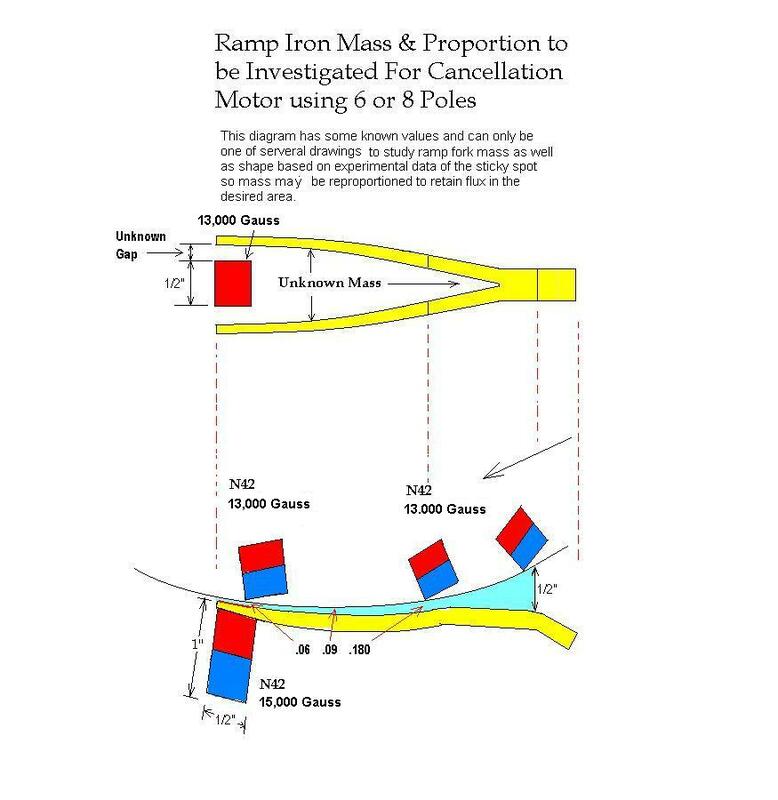 orientation of the ramp and ramp angles for induction. minimum flux at the end of the stroke. END OF STORY. OR we could say for this particular design "Etched IN Stone"
In other words this is the correct build for all early experimenters. Later aluminum shielding or copper and plastic for flux manipulation. these conclusions about what a MADMACK motor looks like. all of the beans but has given us a starting point. motor is designed to do. you are bringing in confusion. Look at the ideas presented for induction ramps. round magnets is not an option save them for your refrigerator. yet using the proper material, including me. beginners in favor of his coming new design in the next few months. before they open a discussion. The rest of you can do your own thing, I will correct you. I am welcome here I will defeat the divide and conquer. Last edited by BroMikey; 03-11-2016 at 07:17 AM. better but like you say what about acceleration? Great progress. Mack did say that square magnets are his choice. This unequal set of forces might be balances in many ways. attractive field is the repulsion but this is what we can not see. several thousandths of an inch or mm. Like I said I have wanted to do this one for years and years. Now I can go ahead and finally scratch this itch. The grain oriented metals for ramps is also very important. BroMikey, it is a safe guess that you are already an expert mechanic. For the benefit of anyone not already being an expert mechanic, a body can find non-magnetic brass and aluminum screws and bolts and nuts also at Loews. And plastic fasteners too, but if you assume yo motor might run faster than about 1.98 RPM, you should NOT rely on plastic stuff to resist the centrifugal force. Last edited by CANGAS; 04-02-2016 at 10:04 AM. MadMack said that everything was PRIOR ART. 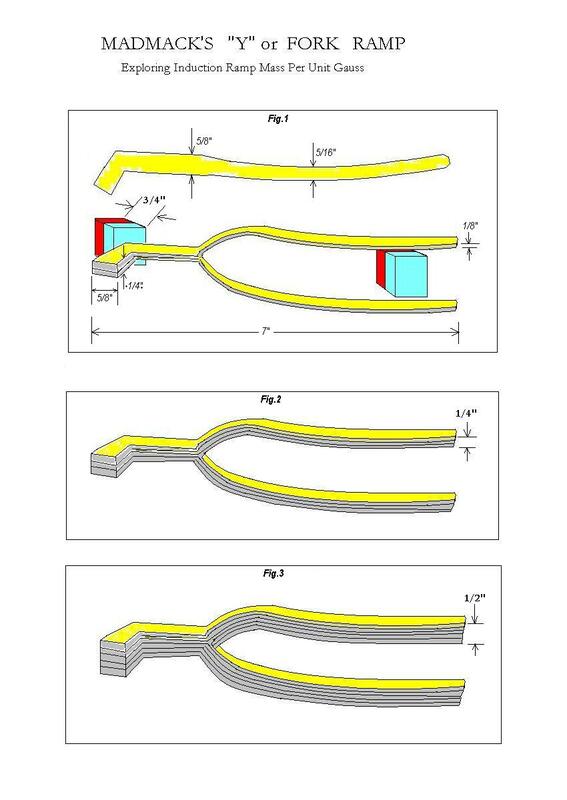 A design can become prior art other ways than already being patented. It can consist of components that have all been very well known for a long time. The combination could be considered a new design and possibly patentable. The combination may have rattled some spook's cage. MM might be under a gag order NDA instituted by the NSA or other MIBs. MadMack; Is your New Design simply an alternative that will safely be outside the other's NDA? And plastic fasteners too, but if you assume your motor might run faster than about 1.98 RPM, you should NOT rely on plastic stuff to resist the centrifugal force. the information might be considered experimental only. to wrap my head around ANY entry level premise. My motor is on hold. MadMack has a better one coming. I should say my second motor using the expensive materials. Split flux gates for a new magnetic motor same idea. I kept developing Mack's Motor all the way, to completion... just me, myself and I...and yes it does work. Wonder why he didn't post this here. You keep going after me, re-posting my posts plus altering them by not reproducing the whole content. Obviously you are looking for trouble. I just notified the Admin. I will contact Aaron Monday morning. Last edited by Ufopolitics; 08-13-2016 at 09:52 PM. Just because someone disagrees with you does NOT make them your enemy. We can disagree without attacking someone. This means YOU especially BroMikey. Actually the secret to make it run lies on the Model built. If You guys use the one Model shown below...it will definitively work! But, you will have to reproduce it EXACTLY like Citfta did above.! Same pieces of wood , don't forget the holes on the left side stator holder...and the silicon ...must be clear. Oh, I almost forget! !...the sheetrock screw must be exactly there, on the right side! Also notice the stator's holders are completely "Asymmetrical" pieces of wood!! If you just miss one single detail...it won't work! Notice the Exact Gap separation from both stators...to rotor! It would have to be like reproducing a Master Piece of Art. Wish you good luck building it! WARNING! : Wear safety eye goggles! !...this motor reaches speeds up to self destruction, then all the construction materials will fly out like bullets! Last edited by Ufopolitics; 08-13-2016 at 10:11 PM. I need to make one small correction. That is hot glue, not clear silicon. And UFO is correct, if you build it it will work just like his. I'm not looking for trouble. I'm looking for this running magnet motor you claim to have completed and is working. And if you click on the icon after your username at the beginning of the quote it will transfer you to the source post and there you can see the entire context. So I am not altering, hiding or misleading anything, just simply reducing your quote to the applicable statements to which I address. Let us see the machine work. This is NOT My Machine Design. 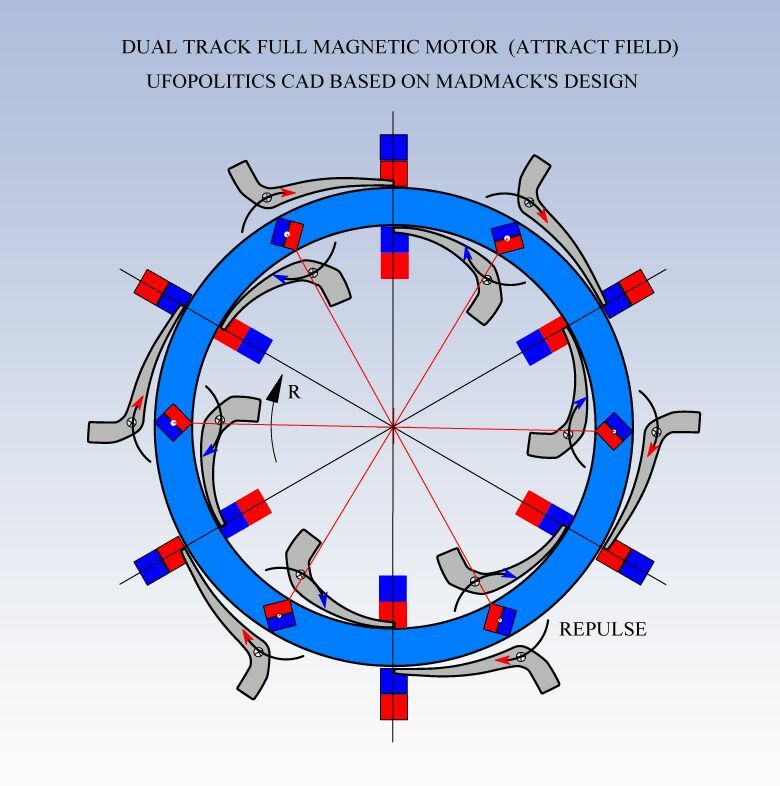 So, If You are SO interested in seeing this Magnetic Motor running, direct your request to the Main Inventor that opened this Thread with his Machine, MadMack. He wrote in the very first page of this Thread that it works. So, if you have any doubts about it running, ask him. On my end, I already responded to you in another post about MY DECISION related to this Motor. And see how simple I could "link" another post without cutting off any words, EDITING and ALTERING my Original post like you did previously. That is a VIOLATION of this Forum Rules. 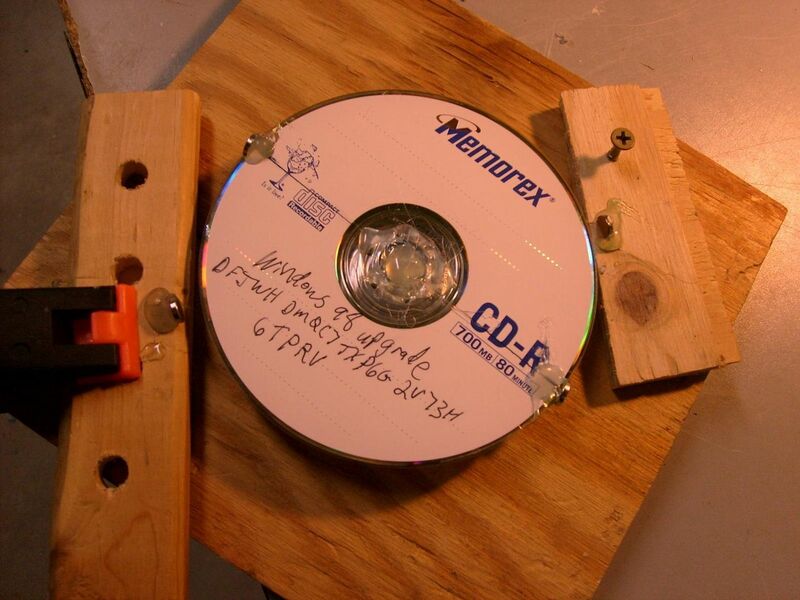 I will go ahead and share here the latest development that I did on my Magnetic Motor. It took me many, many hours of work to reach this Final Design. I did a Zoom Diagram of how I REDUCED AND COMPACTED the Original Modular Structure proposed by Mack. Remember that He proposed to use A Two Rotor Magnets MODULE, (at least) in order to conduct the primary tests on achieving a PERFECT BALANCE so that BOTH FORCES would be CANCELED to a PERFECT ZERO. First the original Rotor Magnets I have ordered had a hole through the Magnetic Axis, but they do not work well for this purpose, due to changes in the rotor mounting. I had to get the SAME SPEC TYPE as before, EXCEPT they have the hole at their Bloch Wall, like shown above (Note the white Dot at center) and you could see the way poles are...This way they are better to be aligned properly, mount them, etc,etc. Like I always do...Blue is North, Red is South for all magnets on above Diagram. As you all noticed I have used Two Stators per each Rotor Magnet, as well as One Ramp for each Stator. 1-FIRST BUILDING STAGE is to Obtain a Perfect Zero Cogging Force, but MAINLY No Sticking at all! !, when passing Rotor Magnet through Both Stators BEFORE adding the Ramps. 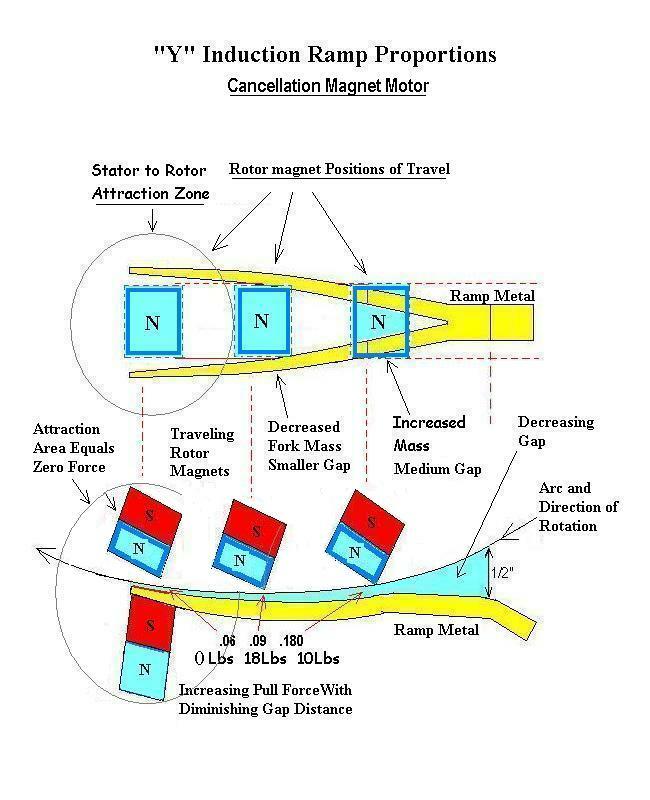 This is the harder step to achieve, since the proximity of both opposed forces acting on each of the rotor magnet poles which are set at such close gap. 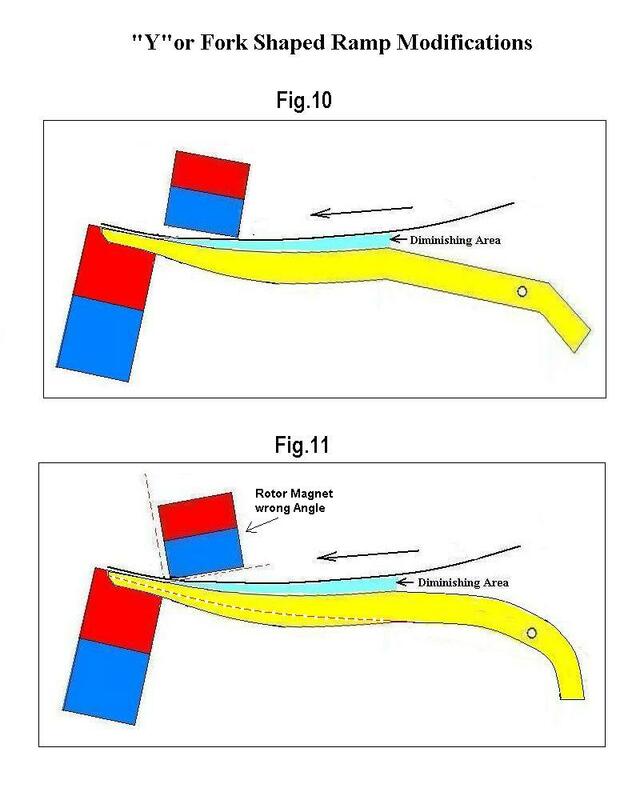 2-SECOND BUILDING STAGE is to Add FIRST the Attracting Ramp and adjust it until observing that "Jump" where Rotor Magnet PASSES that Green Center Adjustment Line. 3-THIRD BUILDING STAGE Here You add the Repulsion Ramp...and adjust it to EXTEND that Jump BEYOND the Attract Angle throw. THIS IS A MUCH COMPACT REDUCED MODULAR STRUCTURE WHICH YOU MUST REPRODUCE AT EXACT BALANCED ANGLE COMBINATIONS TO FILL THE 360º. You could do Three at 120º or Two every 180º, depending on how many total Rotor magnets you are going to install. This Design allows you to much easier OVERLAP Each MODULE. 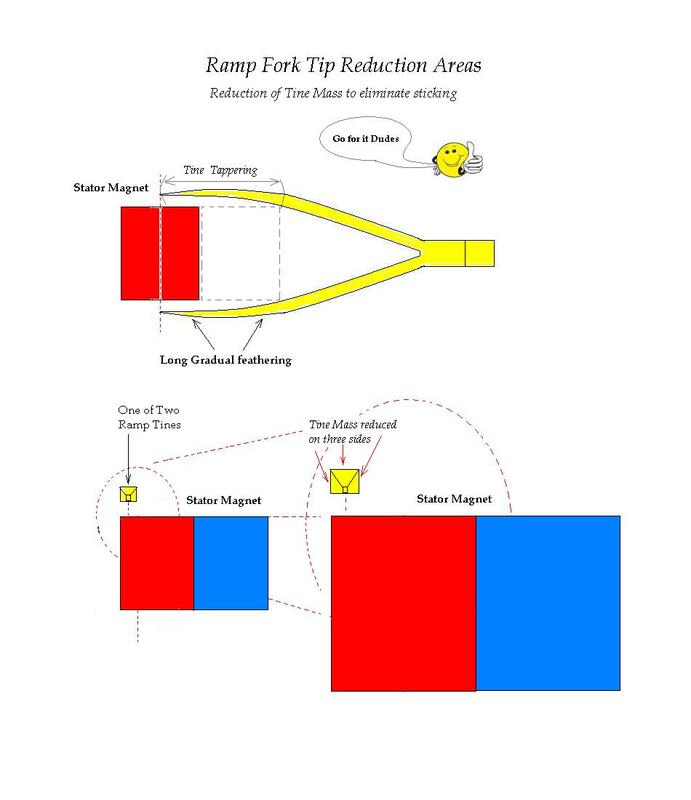 Now, the Rotor Magnets are screwed to only one surface side of Rotor, allowing each rotor magnet to sweep through both Stators. You could use a second screw with or without a bracket to lock each rotor magnet when the right angle, zero cogging is achieved. (cancelled forces). Later on, when you have Motor running, You could add a RING, same diameter as Rotor, but just to the width of magnets in order that each rotor magnet screws through both parts. That would give more strength holding rotor magnets in place. 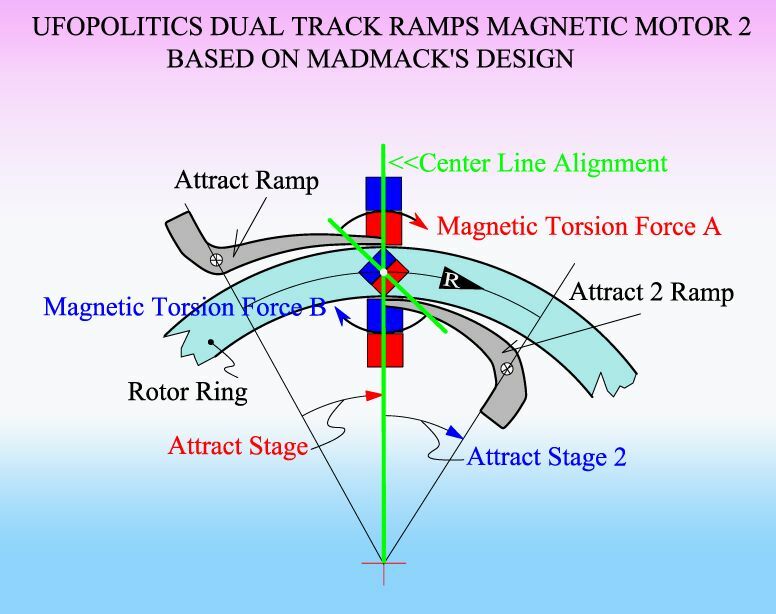 It is VERY IMPORTANT to understand that Mack's Motor uses the Magnetic Fields Tendency to Perfectly self Align to the opposite pole, AS to Align towards the heavier (more Mass) End from the Iron Ramps. And even though they occur simultaneously, Our objective is to "Split them" in Two, where the Dead Line between one and the other is the Green Center Line. 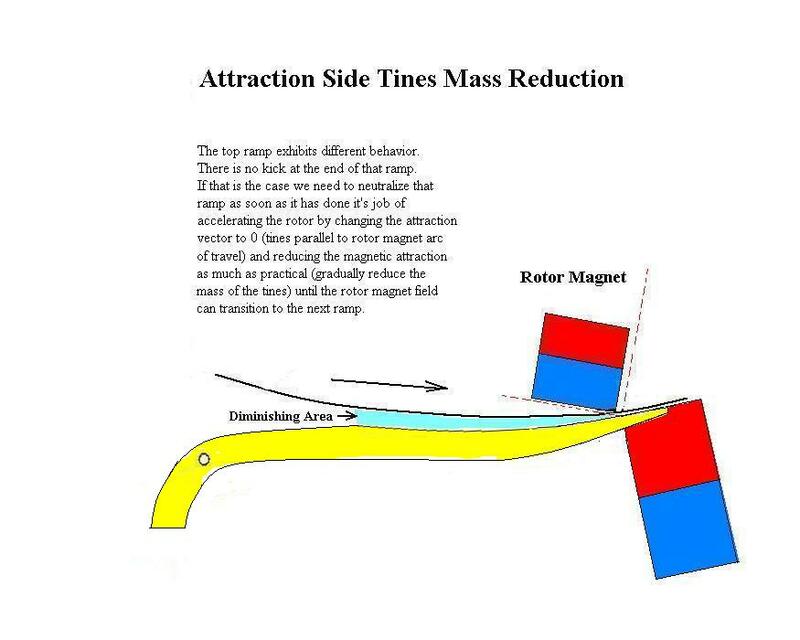 Torsion Force A would be generating the Attraction Acceleration (Red Attract Stage Arrow) Up to the green center line. TFB is off here. 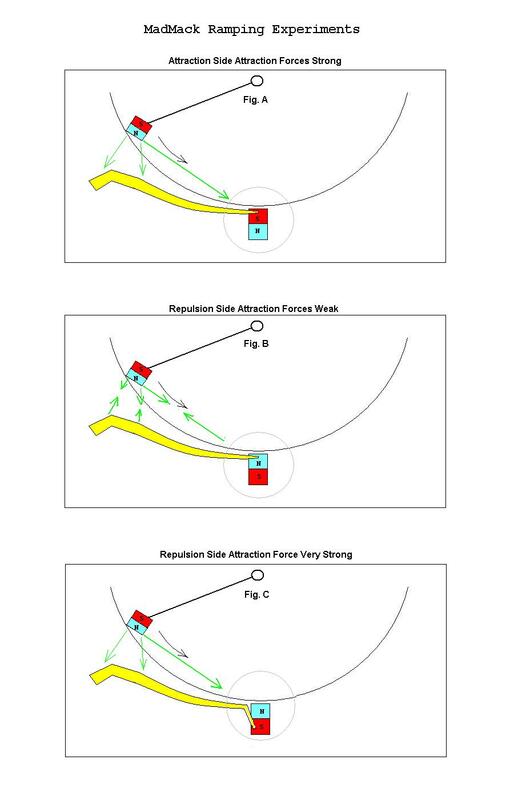 Torsion Force B would be generating the Repulsion Acceleration (Blue Repulse Stage Arrow) From the green center line on. TFA is now off. If You all notice, each Two Stators create a Very Strong Repulsion Field between them, where Rotor magnet flows through, in the case of the Diagram above they are Two South Poles facing each others. However, you could REVERSE this Field, by using a North Stator Repulsion Field in the opposed Module, but having in mind that your Attract-Repulse Sequence Order will REVERSE ALSO. I highly recommend to use the SAME REPULSION FIELDS FIRST, that way you will have very well defined that ALL INNER RAMPS are Repulsion as ALL OUTER are Attract. It is easier this way to detect which end requires adjustment. 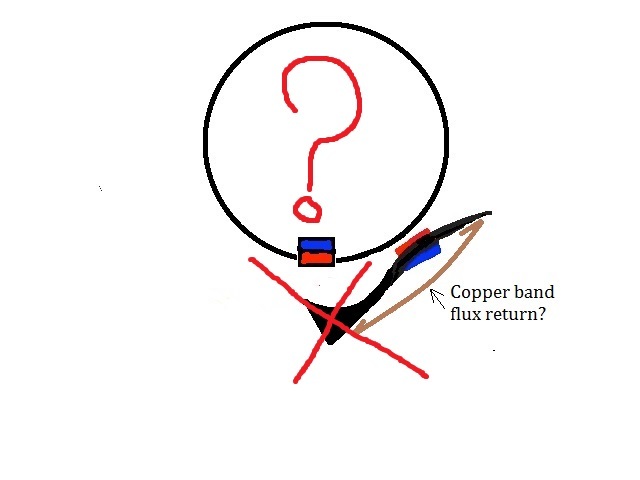 A Repulsion Field is generated by Two Opposite Spins, and there is VAST EXPLANATION about this to understand it fully, however, I do not consider it is necessary to go in detail on this part, PLUS, it is MATERIAL THAT BELONGS to ANOTHER FUTURE THREAD. This design would allow you to build much compact Models than the extended 180º MODULES. Everything else, that Mack has told Us, remains exactly the same way. Remember that this Motor works only if we are EXTREMELY ACCURATE building it. Lousy builds, loose bearings, shaft play, uneven gaps, uneven angles separations, unbalanced magnets, unbalanced rotor will definitively won't allow it to run. WARNING: Make sure you have easy access to the OUTER RAMPS EXTENDED ARMS (What Mack called the Scorpion Head) to adjust, but mainly to STOP MOTOR!! I wish the best of luck on your Motor Build. As I would love to hear Mack's opinion about this design. Last edited by Ufopolitics; 08-15-2016 at 02:56 PM. 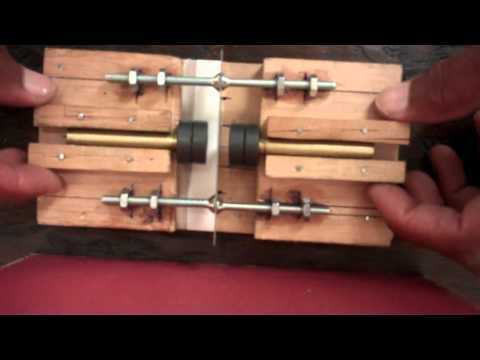 Hello Again to All Builders of Mad Mac's Magnetic Motor. I would like to simplify this following explanation as much as I can...so have I decided to share the second option quoted above, since it is much simpler to understand as it is to balance, meaning canceling forces to zero, which was the hardest part on the original Mack's design. Below I have a CAD of the simplest 180º Module (without Ramps on) just like Mack proposed to start with, except I am adding the Inner Stators like previously displayed. 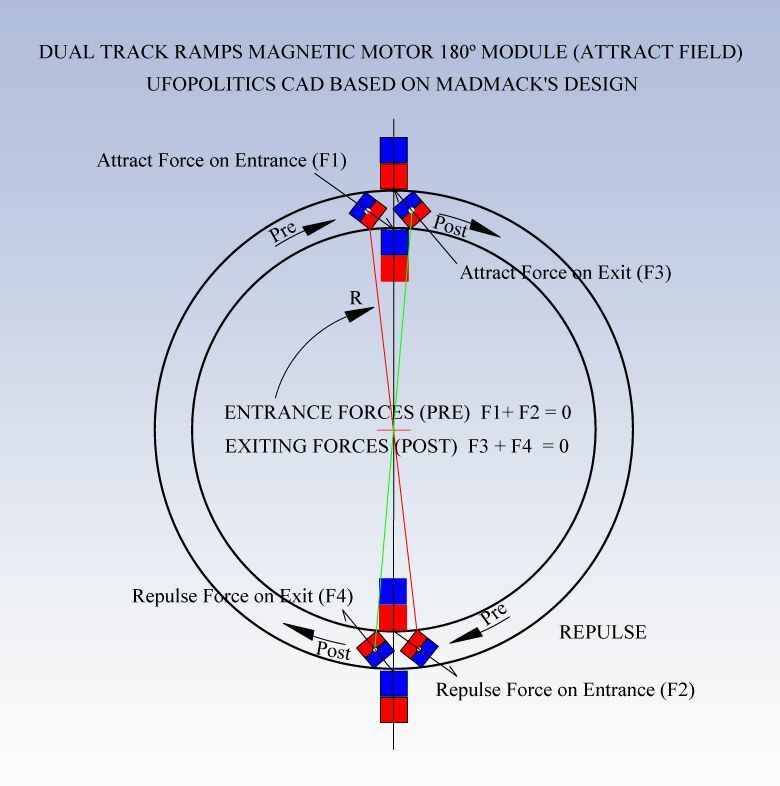 The Two Rotors apart by 180º are framed at Entrance (Red Line crossing the two) and Exiting (Green Line from to rotor magnets) Stators Field. If you look at this design and just take off the Inner Stators, you will have Mack's design...simple. The Inner Stators will offer the "cross play" ASSISTING the canceling forces at both stages, entering (Pre) and exiting. (Post). And when we add All Ramps at 180º, we notice the Inner Ramps would be assisting in the exit (Post) acceleration stage. 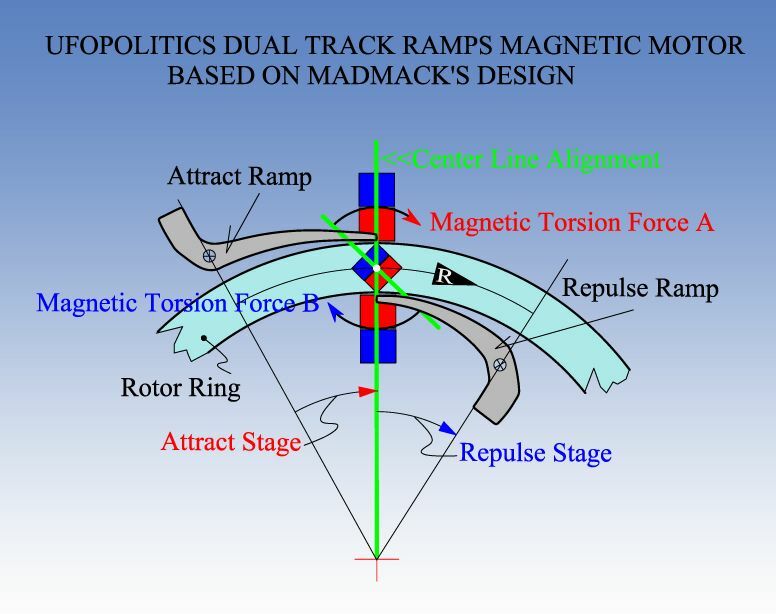 And again, if we take off the Inner Ramps, we will have Mack's Ramps Design. Inner Components reinforce all magnetic forces plus Ramps Accelerations to Max Values per Interacting Angle with Stators. 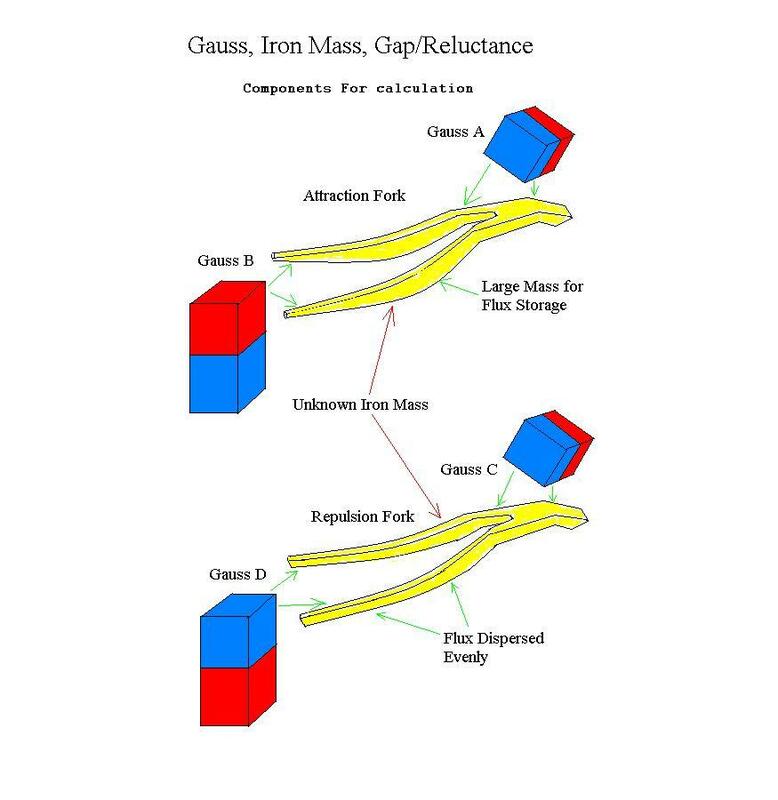 As shown above, this design is very simple to overlap, while Inner Ramps offer the "Jump" or transferring of "Flux" to next Outer Ramp for smoother Transitions, since they are about same iron laminated mass. Last edited by Ufopolitics; 08-15-2016 at 07:15 PM. motor you claim to have completed and is working. is given for review will take time to digest. what they consider a lack of information. forum. Each man must work at a normal job and later further his findings. This group of men are not here to save the world. No blind hero's here. of the investigation by offering experimental results. We will all come to realize many working principles all at the same approx. time, everyone coming forth with machines and no one hero to shoot at. but I will rise to confront you regardless. Your reason for being here will finally be uncovered. Instead of angling the inner magnets on the router lets just leave them with say north facing up and evenly spaced around the circumference.The outer 'ramps' or control device I have to explain my thoughts here as i cant send a pix or drawing and i hope someone gets it and can do that. picture 2 tall triangles laying down sideways joined at the base with a hole thru the centerline.This is a magnet but the one triangle is the north and the other the south.The hole is the pivot point to bring north or south closer to the router.the distance from the diamond shaped magnet would have to be spaced right say starting around 10 or 20 thou and the angles of the diamond shaped magnet would have to be right say about 30 degrees each side.now several of these diamond shaped magnets are spaced around the router but not evenly.say 2 inch gap then maybe 2.5 inch gap then maybe3 inch gap etc and then bring it back to 2.5 then 2.these are just numbers to give an idea of spacing.with a gear drive or linkage setup this could work as a self starter,brake and governor all in one.With the right circuit to regulate the RPMs then the right adjustments could made automatically for speed control as the unit is operating.You have a push side a pull side and the sticky spot should be negligable because other odd spaced diamond magnets will more than cancel that out.Can anyone grasp this what I am trying to describe here?Has this even been done by anyone before or patented?I want this to be an open sourced idea so no one can patent it if it never has been done.Comments? I should clarify that the outer magnets can move up and down at the ends thru the pivot point which is attached to linkage or gears or even solenoids at each corner.this way they all move in unison for the adjustments or tuning so to speak.The reason for the diamond shape is to act as sort of ramp idea similar to madmacks idea but no steel and both poles are used coming and going.I pretty sure though once this thing hits a high RPM then this control mechanism wont work as it will be in a runaway effect.So by keeping it lower RPMs then this motor could actually be hooked up to say the generating side of a genset minus the gas pot and then it should be free power. Did you do this experiment? Self starting magnetic engines are here to stay. Been over 3 years since MadMack posted on this forum. Although I did not participate when this thread was active, I did watch it and always wondered about this guy. I stumbled across him on overunity dotcom yesterday. I wonder if there is a deeper connection between MadMack and IEC. But from the beginning, I felt MadMack had gotten stuck on his development and was fishing the membership here for a solution. 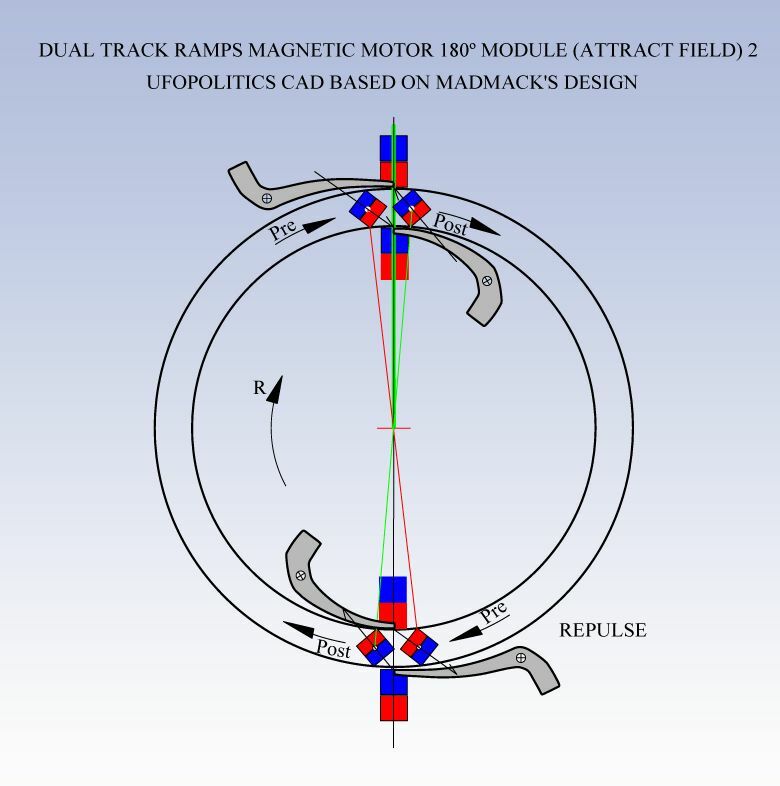 Notice that UfoPolitics, nor anybody else, has shown a working magnet motor. Maybe this Earth Engine? I'm not holding my breath. as far as the 50's and are not likely to hand over the data for free. potentially the next step to eliminate the opposition. 10 million is cheap compared to the trillions brought in year after year. there. Well the V-Gate splits the flux and dominates on youtube. offer plenty of excess power. devoted almost no time to it. There should be a benefit for any motor just using the "Y" elements idea. Last edited by BroMikey; 04-14-2019 at 06:54 AM.